After facing a calamitous scandal that cast doubt on its very future, the New Orleans Jazz Orchestra has returned with new leadership and a new album, featuring songs by its city's patron saint of rebirth, Allen Toussaint. In 2005, even as the flood waters that rose in the aftermath of Hurricane Katrina subsumed his home along with countless others, Allen Toussaint was reluctant to leave his city. But the elegant architect of New Orleans rhythm and blues was left with no other option. Just a day after his evacuation, in an interview with Rolling Stone, he described the experience less in terms of what had been lost than what could yet be gained. "I'm looking forward to the future of rebuilding New Orleans," he said. Is it any wonder that Toussaint, who died in 2015, has lately become a totem for the New Orleans Jazz Orchestra? Songs: The Music of Allen Toussaint is the insistently hopeful new album by the band, which won a Grammy in 2009 but has spent the last few years recovering from a calamitous scandal that made international news, befouling the NOJO's name and casting doubts on its very future. During an album-release concert last Friday at the New Orleans Jazz Market, its sleek home in the Central City neighborhood, the NOJO struck a tone of carefree ebullience — opening with a version of Toussaint's "Southern Nights" enlivened with a streetwise second-line rhythm. 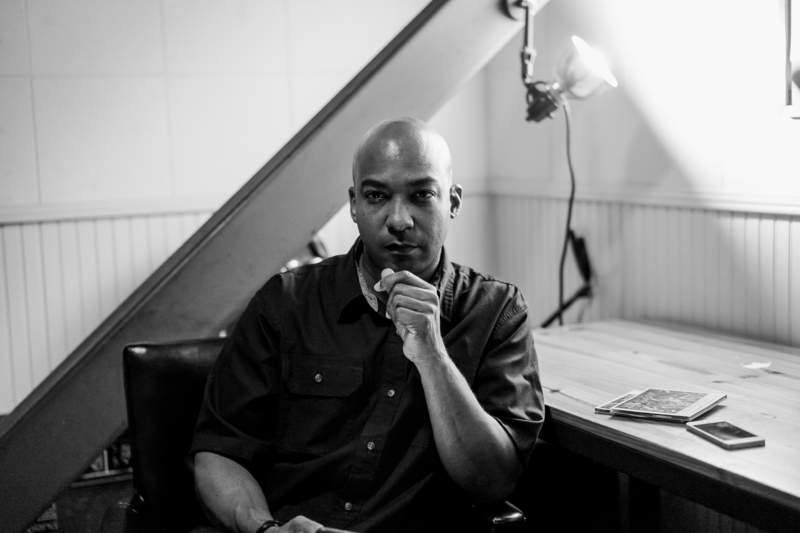 The organization's artistic director, Adonis Rose, began the concert behind the drums before stepping forward to conduct the band. A genial host, he made a number of warm acknowledgments from the stage, thanking members of Toussaint's family and the NOJO's board. Conspicuously absent was any mention of his predecessor, trumpeter Irvin Mayfield. This was understandable, maybe even expected. Most in the audience were probably aware that Mayfield and Ronald Markham, the NOJO's former president and CEO, are awaiting trial on federal charges of conspiracy, money laundering, wire fraud and other crimes. Their 2017 indictments, which Alison Fensterstock catalogued for NPR Music, followed highly public allegations that they'd misappropriated more than $1.3 million from the New Orleans Public Library Foundation. Mayfield and Markham both resigned from the NOJO in 2016, and Rose, a founding member of the orchestra, took the helm. He inherited a mess, as he recalled several hours before Friday's concert, during an interview in his dressing-room suite. "A lot of people were upset about what happened," Rose said. "We lost our management, we lost our booking agent, we lost our record deal, we stopped traveling. We lost funding from institutions; we had sponsors pull out. It's difficult for any organization to come back from that." 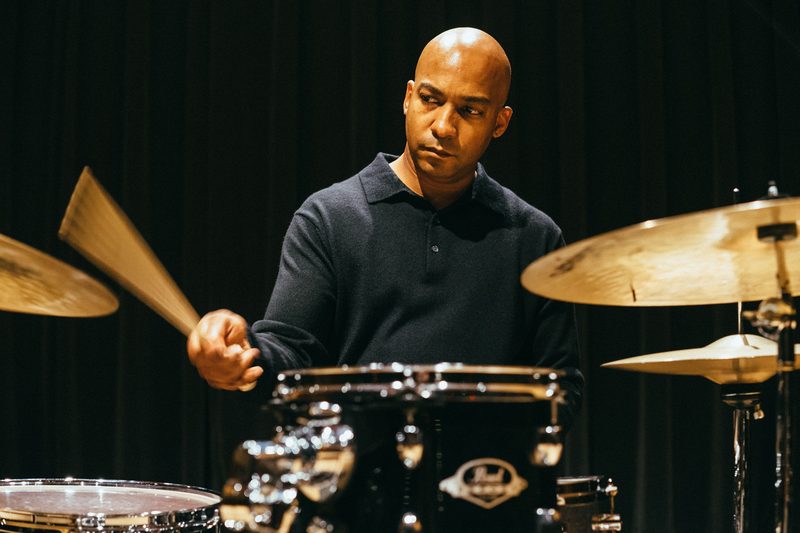 Adonis Rose played drums for the New Orleans Jazz Orchestra before being appointed its artistic director following the resignation of Irvin Mayfield. For more than a year, the shape of that comeback looked uncertain. The NOJO's board, which includes executives from banking and oil companies, remained in place, and the musicians in the band were eager to get back to work. But operations slowed to a crawl. Some new policies of oversight were put in place. The NOJO's salaried staff was reduced by half — to six, including Rose and a new president and CEO, Sarah Bell. Bell, who had been working in board development, recognized the need for both a brand rehabilitation and improved community relations. "When I came into this role," she said, "it was to provide stability for the organization, and to slowly rebuild our credibility — especially here in New Orleans. When anybody feels like you violated their trust, it just takes time to repair that. It's been a lot of work, a lot of long hours, to get us to this point." Rose first met Mayfield when they were both in high school; he said they're still friends. But when describing the leadership transition, he voiced an implicit critique. "It takes time for people to recognize you as the leader of an organization when your predecessor was a person whose picture was on everything," Rose said. "I can't remember the last time I'd seen a picture of the full orchestra anywhere. People associated the organization with him, because that's all they knew." When the orchestra opened its first post-Mayfield season last year, Jennifer Odell reported on the comeback for JazzTimes. Odell, who also wrote an in-depth profile of Mayfield in 2015, when he was still riding high, has observed a general weariness in the musical community about his disgrace. "There's been a reluctance to say his name," she said. "The story is exhausting; nobody wants to talk about it." She's sympathetic to local suspicions that the heavy-handedness of the charges — Mayfield initially faced a 19-count indictment, which has since risen to 23 — bears direct relation to his conduct as a flashily self-assured black man. Mayfield's will to forge onward, with determined grace, became a poignant symbol for a battered city. And the New Orleans Jazz Orchestra, which he had founded in 2002, became a major beneficiary of the goodwill that Katrina's devastation inspired. "It really took us from being a local organization to an international organization, almost overnight," said Rose. The sense of betrayal felt by Mayfield's community is closely related to his role as a cultural ambassador. But many other members of the Katrina diaspora came to embody a similar pride — perhaps none more successfully than Toussaint, an ingenious pianist, songwriter and producer. Relocating to New York, he began a popular solo residency at Joe's Pub. He made a well-received topical album with Elvis Costello. And he reached a level of mainstream recognition that had long been unattainable — turning tragedy into opportunity, all in the name of his beloved hometown. "We lost our management, we lost our booking agent, we lost our record deal, we stopped traveling," Adonis Rose says of the period following his predecessor's indictment. "It's difficult for any organization to come back from that." 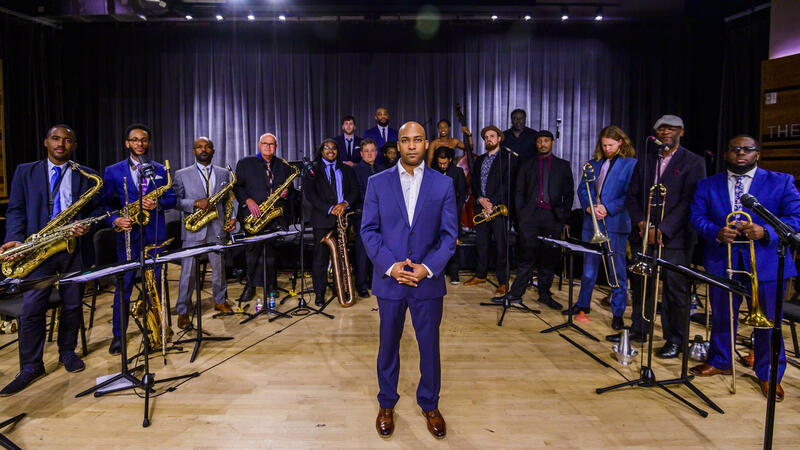 For Adonis Rose — whose uncle, Chris Severin, was Toussaint's bassist for many years — the theme of restoration that flows through Songs: The Music of Allen Toussaint is something like a rallying cry for NOJO as it has rebuilt itself. The album deftly enlarges and recasts a few tunes made famous by others, like "Java," a top 10 hit for New Orleans trumpeter Al Hirt in 1964, and "Working in the Coal Mine," which brought similar results for rhythm-and-blues singer Lee Dorsey in 1966. A featured vocal guest on two tracks is Dee Dee Bridgewater, an NEA Jazz Master whose name appears above the Jazz Market stage. (She collaborated with Mayfield and the NOJO on their previous studio release, Dee Dee's Feathers, in 2015.) At the concert last week, Bridgewater's parts were capably handled by Nayo Jones, the orchestra's house singer; her duet with Philip Manuel on "With You in Mind," a ballad popularized by Aaron Neville, was calmly smoldering. Elsewhere, members of the band stepped out for vocal features: trombonist Michael Watson smoothly handled "Southern Nights," and trumpeter Leon Brown, a.k.a. Kid Chocolate, sang a jaunty original called "Zimple Street." All together, the concert told the story of a band with a surfeit of talent, an abundance of charm and a clear sense of place and mission. Those last two things are related, as the organization surely grasps — perhaps even more fully now than before its recent travails. "Sometimes it's hard to realize what you have until you almost lose it," Rose reflected. Sarah Bell, who moved to New Orleans to help rebuild after Katrina, made the connection more explicit. "This organization had to suffer a tragedy, so to speak, and then make a consistent and deliberate effort to rebuild into something stronger," she said. "This organization is extremely resilient, as is this city."